It’s the end of May, and that means one thing…(well actually a lot of things), but one of those things is that it is graduation season. Being a never ending student, this month meant the end of my post-graduate classes. After a final presentation that my classmates and I gave to the city of Hoboken a bunch of us headed out to The Shannon celebrate. 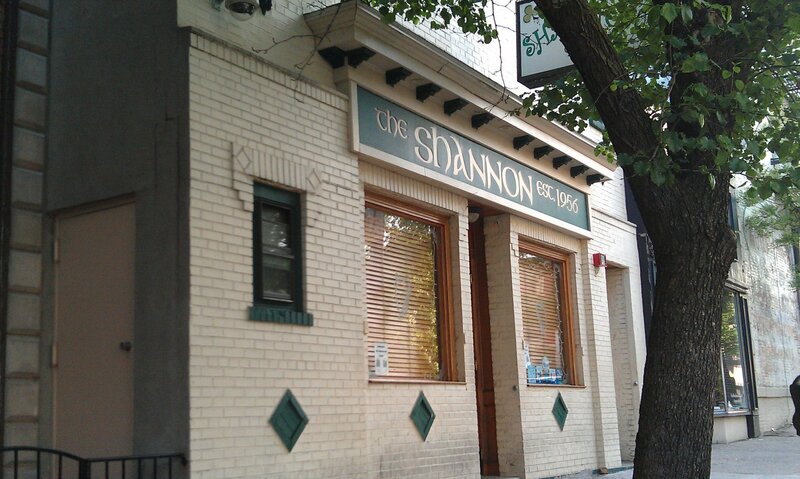 The Shannon is a big weekend hot spot located on 1st Street between Washington Street and Bloomfield. Located in a building that looks like it used to be a theatre, The Shannon has been in existence since 1956 (according to their sign). They did undergo a renovation a few years ago and the place has clearly been well kept. It’s not unusual to see a long line on Friday and Saturday nights of people waiting to get into this place, but on this Monday we walked in around 8ish and there was probably only 6 or 7 patrons inside. Most of my classmates filed in and I took full advantage of their great Monday specials. They offer a 1,2,3 deal with $1 mugs, $2 pints, and $3 everything else (house liquor, imports & wine) for happy hour Monday – Friday, but any time on Monday is happy hour as well. Even better for me, they also have $8 pitchers of which I bought a bunch to celebrate. Obviously these aren’t the highest quality beers, but I think everyone finds themselves in a situation where quantity supersedes quality. Since it was basically empty, I had the chance to really see all of The Shannon. The back room is huge, with a line of dart boards, a foosball table with the all important beer rack on the side, DJ booth and huge second bar. Other than when some of my classmates and I played darts and foosball, no one bothered to head back there the entire time I was there. 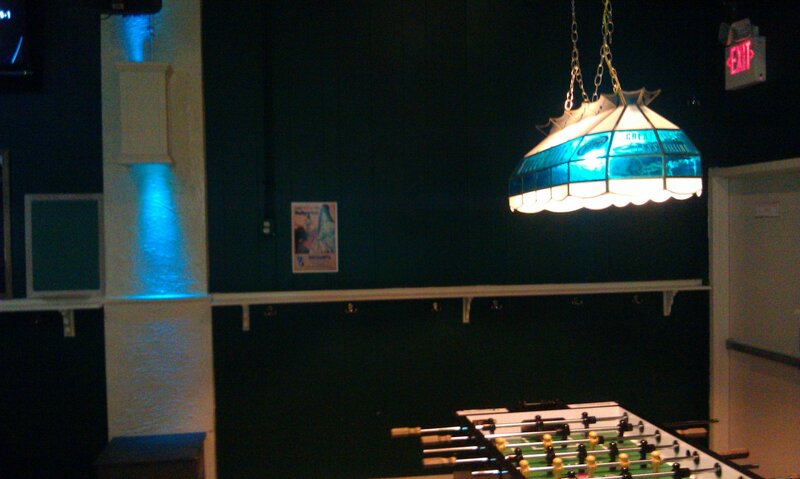 The front room has plenty of TVs and a nicely kept pool table. 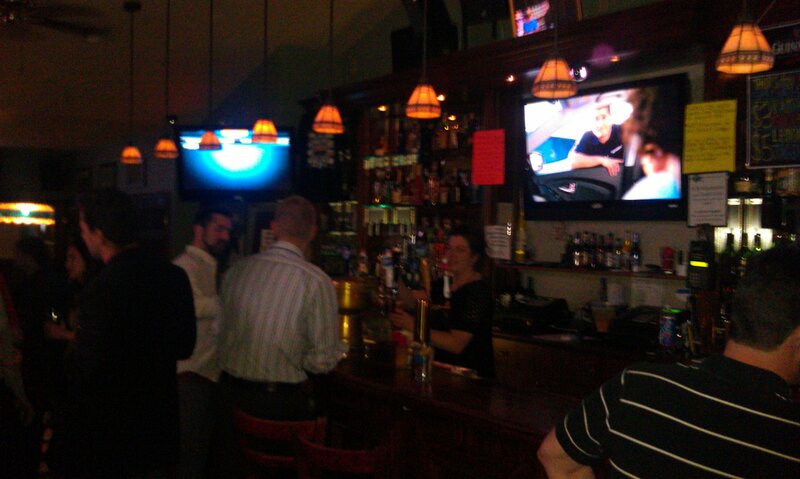 It was actually refreshing to be at this bar without it being super packed. We were able to sit in the chairs, and have the bar put on the baseball, basketball, and hockey games that we wanted to watch. The bartender was great, providing me a couple of free pitchers which helped keep the beer flowing and the tab low. They also have a huge book of menus so that you can order whatever you want from any Hoboken restaurant. 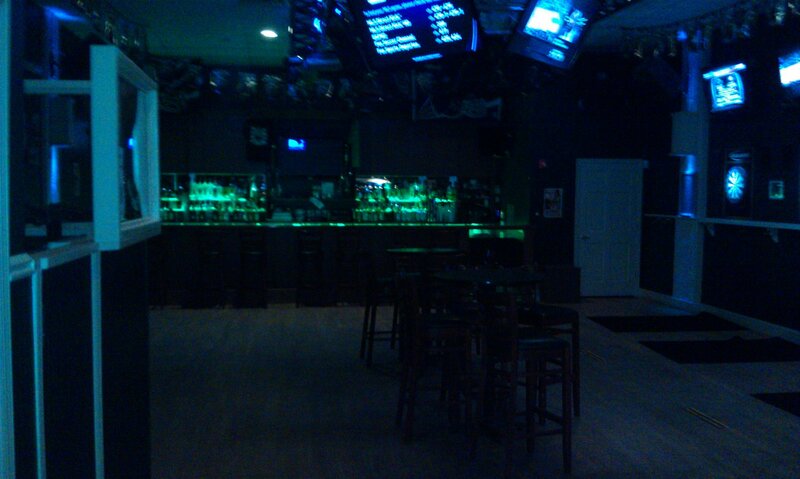 Preconceived notion – Irish party bar with a rowdy weekend crowd. I didn’t know what to expect on a Monday night, but I figured with the cheap drink specials all day Monday that there would be a decent crowd. 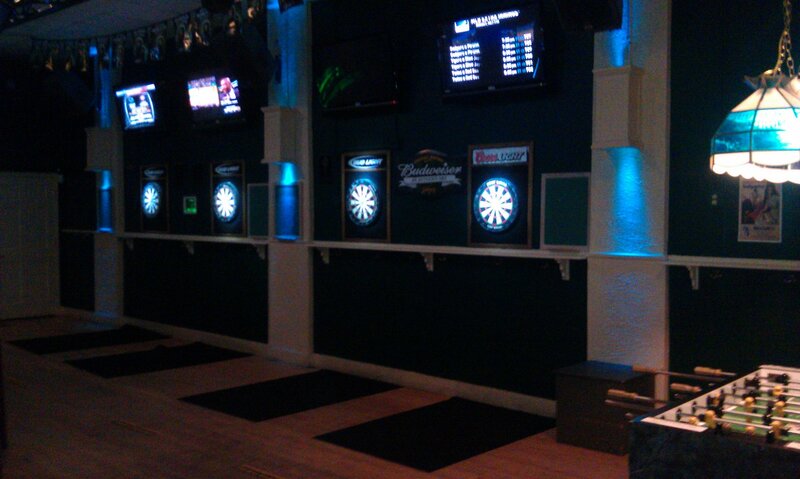 Bar Type – Sports Bar turned party bar on the weekends. They’ve got tons of TVs all over the place. 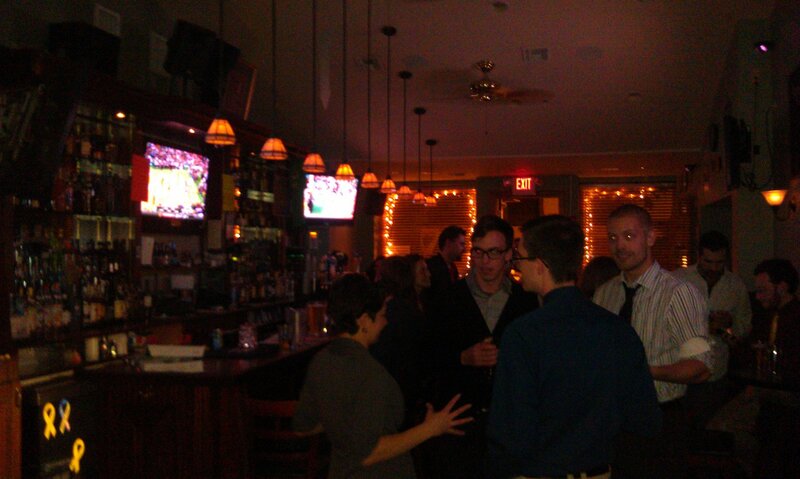 Crowd stereotype – I think my group outnumbered the rest of the patrons. But in general it was late 20s and mainly guys. Near the end a couple of 30 year old and up women showed up. Value – Great value, I bought a ton of very cheap pitchers, and even got thrown a couple of free pitchers back my way. They certainly take care of you here. I can’t promise you that on their busy nights that it will be as good of a value, but this is one of those places that it pays to go to when they aren’t packed. Catch up with a friend – Pretty good, I imagine on the weekends it’s a little tough but during the week its good. First or last drink of the night – Again, not during the weekend. I would honestly say that this is a great place to spend the bulk of your night at. 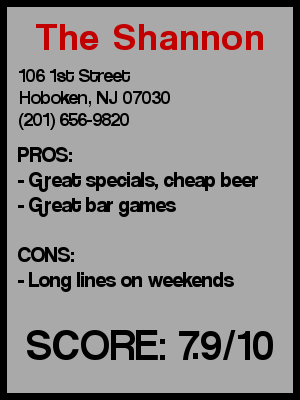 Overall - It was my pick of any bar in Hoboken to celebrate our final project presentation and I was very happy that I picked The Shannon. Cheap drinks, good bar games, easy seating/standing, it was perfect. It’s amazing how much this place changes on the weekends compared to the week, but I had a great time getting pretty hammered on a Monday night. Brought me back to the good ol’ days of being in undergrad. I slummed it a bit with the beer selection, but extra points for being so cheap. So consider me pretty surprised with the way it turned out. It’s nice to know that this place still has the neighborhood feel, at least 4 days a week. On a scale of 1-10, I’ll go with a 7.9.